I often wonder what might have happened to his little male fawn that I photographed back in 2006. 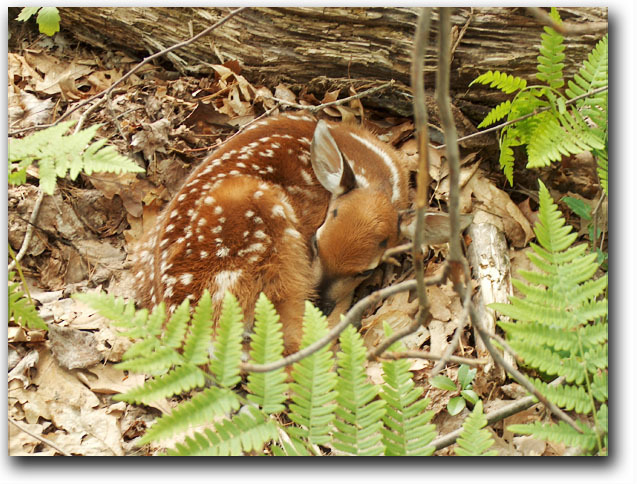 My step-son, Carter, came back from his walk in the woods that spring to get his camera as he had found this little fawn back in the woods. I grabbed my HP 945 digital camera and went along with him. It really was my first time in the deeper part of the woods. We were sure mom was watching from the background as we both shot a few photographs, careful not to disturb this little one. It’s been about six years now and we have hunters in the woods. Last year one of them caught a glimpse of a ten-point buck , but (fortunately) he was not able to get a shot. Could this big buck be the little Bambi I photographed all those years ago? 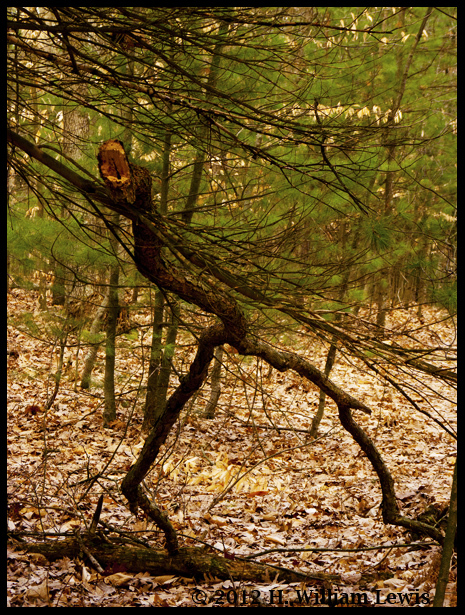 Who knows, but I have always wished him a long life as he wanders the woods. Wow… The idea of feeling what the subject is telling you, not just the clouds, and the trees and the grass and whatever as objects, but as something that has a story to tell. Something that transcends the camera. It’s something you feel inside. Sort of like the feeling a musician puts into the music. Not just what the composer felt, but adding to it, sometimes subtlety but there. And so, that is what I am going to try…feeling the woods the next time I’m there. I’ll let you know how it works out. 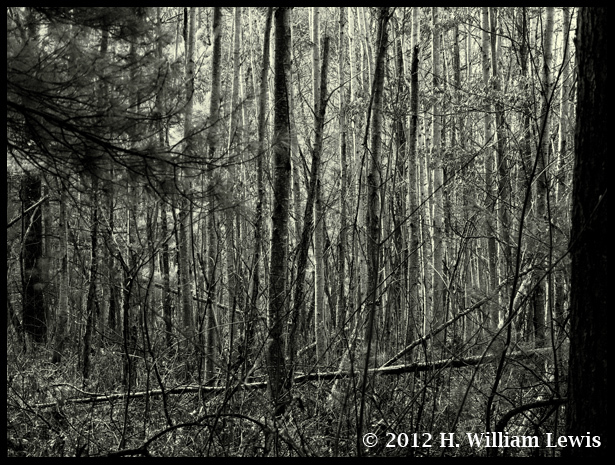 Yesterday Buster and I took our walk through a part of the woods we haven’t been to since last fall. Imagine our surprise as we crested a little rise in the trail to find this fellow walking towards us. Buster ran up and raised his hind leg in a watery salute and after snapping a photograph I asked him who he was and where he was headed. “I am Uright of the planet Mars. My ship just crashed on your planet and i am in search of a fusion engineer. Do you know of one?” he asked. I guess he must have found his way home as I haven’t heard from him today and we didn’t see him in our woods walk. Oh well, just another interesting day in the Acker Woods. 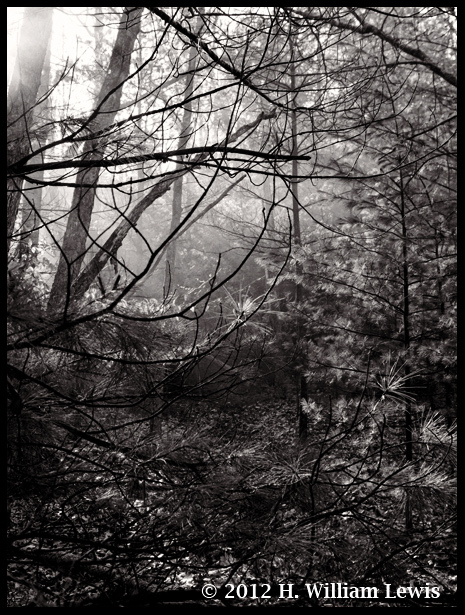 I consider Clyde Butcher to be the Ansel Adams of today. What Adams did for the American West, Butcher does for the Florida Everglades. I interviewed Clyde back in 2003 when I was writing for a Sarasota, Florida weekly. I found him to be warm and outgoing with a willingness to share his knowledge of photography. The image above is my tribute to Clyde and a thank you for the inspiration that he gives. Clyde Butcher was interviewed recently by the Sun Sentinel about his exhibit at the Miramar Cultural Center, 2400 Civic Center Place, Miramar, Florida, (954) 602-4501. The exhibit is a collection of photographs Clyde shot with his 8-by-10 field camera. (a Civil War camera) between 1986 and 2001. The exhibit will be on display through August. 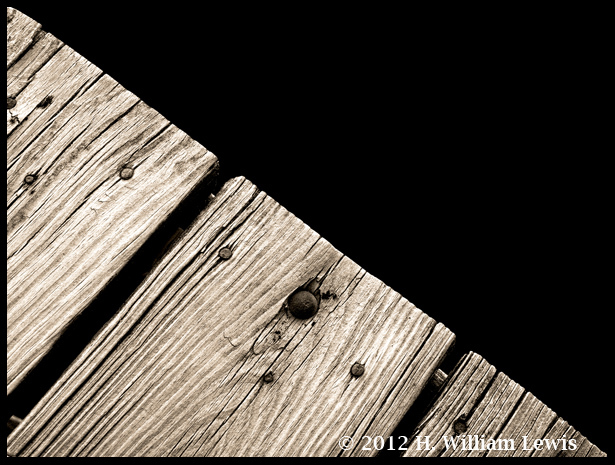 The look of old wood in black & white always makes me think of “the good old days” when the images of Ansel Adams, Edward Weston, Alfred Stieglitz, Dorothea Lange, Walker Evans and others were in vogue. I remember as a young boy laying on the floor looking through the pages of the latest Life magazine with all of those amazing black & white photographs. Black & White photographs had character. They didn’t rely on color to make them stand out. Not that there is anything wrong with color, but sometimes there is more to a photograph than color. Sometimes the color needs to be stripped away so that you can see the image for what it is. The form, the way the light caresses it, the contrast between light and dark, the feeling. Yes, there are great color photographs and photographers that shoot in color. But to me, the magic of black & white will remain. 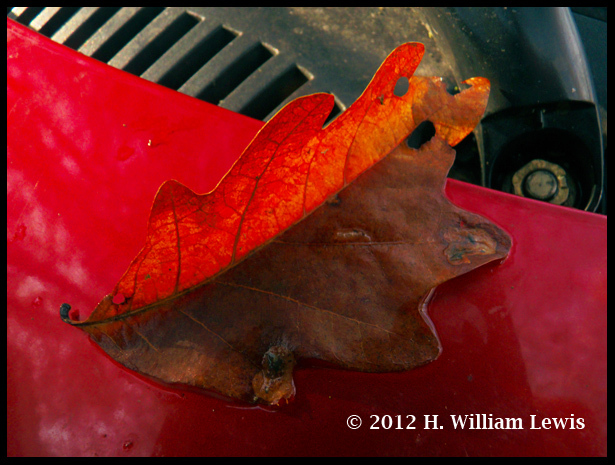 As I was walking by the car yesterday morning on my way back to the house with Flan, I noticed this leaf lying on the hood of the car. I was struck by the way it had curled and the way the morning light was reflected from the hood through the upper part of the leaf, bisecting it into two separate tones of color. To me it was one of those magic moments when you are struck by some small little thing that makes you stop and go, “WOW”! Once upon a time I was a bright shiny new car. Once I rolled from the MG factory in England leather seats making the interior smell as only a new car can. Once upon a time I was loaded on a big ocean liner for shipment to the United States. I was so proud, I was going to America! Once I arrived to America I was trucked to a big new car dealership polished to a high gloss and placed in a beautiful showroom for all the world to see me. One day a young couple came in and fell in love with me and took me to their home where I was their pride and joy for a few years until the baby came. Now I was too small for the three of them so I was taken back to the dealership and traded away. And that began my downfall. Each time I had a new owner they loved me for awhile and then I was cast off to someone else. No longer was i bright and shiny. No longer could I hold my head up high as I was driven down the highway. And now I sit abandoned in a yard with other castoffs. No longer does my motor purr with power. No longer does anyone drive me down the highway with their hair blowing in the wind. I have been sent here to die….but, Once upon a time I was something else….Once upon a time.